For 30 years, we have researched, developed and applied powder coating technology. With a foundation in countless hours of real-world testing and experience, we continually improve our process. Our advanced experience enables us to serve a wide variety of industries, including industrial, automotive, OEM's, medical, retail, architectural and agricultural. Keystone Koating is AAMA 2604-13 verified. Verification is achieved through rigorous testing over an extended period of time. Keystone Koating is also a certified applicator of powder manufactured in compliance with AAMA 2604 standards. Keystone Koating is ready with streamlined services that include assembly, packaging, pick-up and delivery. We have two facilities. One in Lititz, PA, and one in Mifflintown, PA enabling us to serve you well. Keystone Koating began in 1986 as a way to professionally coat the metal products manufactured by the Paul B. Zimmerman, Inc. family of companies, particularly PBZ LLC’s metal fabrication plant based in Lititz, Pa. As we established a reputation for quality and customer service, outside firms contacted us to powder coat their products. 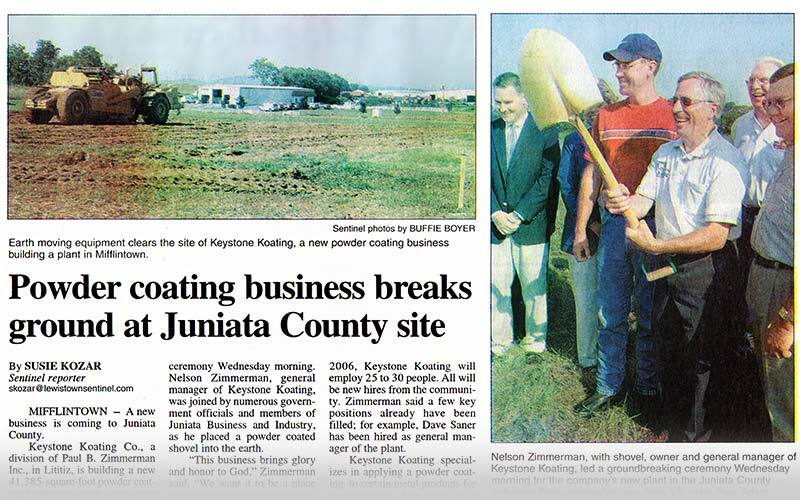 In order to serve our growing list of clients, we added a second location in Mifflintown, PA in 2005. We have continued to grow over the years and pride ourselves in creating mutually beneficial partnerships with our clients.